These images connect the elements of worship with the story of Scripture. As we place God’s name on God’s people in the Invocation, we are taken back to the burning bush, the dedication of Solomon’s temple, the Wilderness Wandering, and our own baptism. From the images related to Confession and Absolution, to the song of the Bethlehem angels and the cry of Kyrie!–from the metaphors for God’s powerful Word to the images of our response as living sacrifices–from the shaking of the temple in Isaiah 6 to the Lamb of God imagery that runs from Genesis to Revelation–our worship is shaped by the texts and images of God’s salvation story. These images are used on screen in worship and teaching at Peace Lutheran Church, Hurst, Texas and each of these hang seasonally in our sanctuary as 8 by 12 foot banners. Connecting our worship rhythms to the stories and images of Scripture has helped revitalize a sense of God’s presence with us in worship as He comes to strengthen our faith, forgive our sins, and send us out with His presence into a world that desperately needs Jesus. You can see some of how we used imagery from these banners in worship and Bible class by visiting Peace’s YouTube channel here. 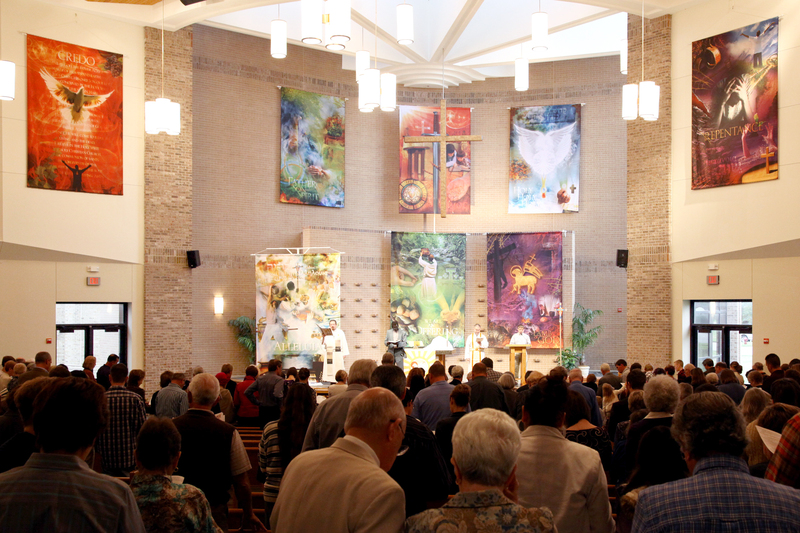 In a sermon series on worship, Peace had 8 of the 10 banners hanging at the same time. Below you can see a couple of examples of how we have used the banner imagery in Bible study and worship. All images copyright 2011, Justin Rossow and Peace Lutheran Church.